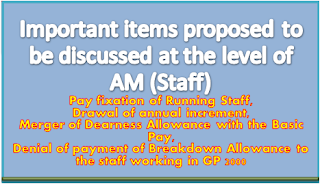 Sub: Important items proposed to be discussed at the level of AM (Staff)-reg. Pay fixation of Running Staff — modification needed in RBE No. 93/2016 dated 02/08/2016 issued by the Railway Board. Drawal of annual increment to the Running Staff on their pay as laid down in Rule 1303 (F.R.9) (21) a read with Sub-Rule (iii) of IREC, Vol. II (Sixth Edition 1987), Second Re-Print Edition 2005 — NFIR’s PNM Item No. 10/2016. Merger of Dearness Allowance with the Basic Pay w.e.f. 01/04/2004 — Computation of emoluments of Running Staff for granting retirement benefits — NFIR’s PNM Item No. 23/2017. 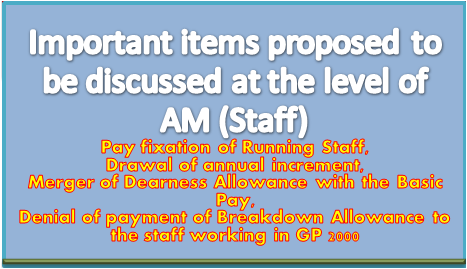 Denial of payment of Breakdown Allowance to the staff working in GP 2000/Level-3 of 7th CPC — Extant instructions need to be modified for ensuring payment. Facilities for Divisional CouncillBranch Executive Council meetings of the recognized Unions in the Railways — NFIR’s PNM Item No. 16/2015. NFIR, therefore, requests the Railway Board to kindly arrange to fix the date for holding meeting soon on a date convenient to the Board as well the Federation.